Golf courses in Northern NSW and Gold Coast Queensland, QLD, Australia. Public golf courses southern Gold Coast, hinterland and NSW north coast. Play & Stay golf packages. Whether you want a challenge, or just a social game with a well earned reward at the nineteenth hole, this region has a course to suit you! 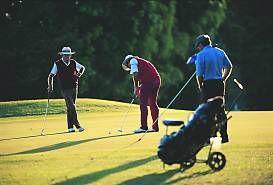 Golf courses and clubs in Northern NSW and Gold Coast hinterland, QLD, Australia. Regional golf courses are renowned for their picturesque surrounds and good layouts. Whether you want a challenge, or just a social game with a well earned reward at the nineteenth hole, this region has a course to suit you! Local accommodation listed here may have full golfing facilities, practice greens, be able arrange rounds on local courses, or have Stay & Play golf packages available with local courses. Or you can create your own golf tour of the region, and visit various courses when booking nearby accommodation selected by us, shown below the course directory. Please note; Course directory info - holes/pars/length correct as at 15/12/2016. Please confirm with the golf club if neccessary. Gold Coast courses/clubs north of Burleigh Heads aren't listed by us. We'd like you to enjoy the challenges of our regional courses! Selected resorts or apartments below are either on-site or within 3km of the golf establishments shown. Family-friendly 5 star full service hotel with 4 restaurants, 2 bars/lounges, tennis courts, playground and games room, gym, a full-service spa and 24 hour front desk. Close: Royal Pines Resort Golf Course, Emerald Lakes Golf Club, Carrara Gardens Golf Course. Adult only "glamping" style retreat with private hot tub and beautiful mountain views. Each eco-friendly, luxury tent is equipped with a kitchenette and a bathroom. Canungra Golf Club is 2km drive. Family-friendly hotel with 2 outdoor swimming pools, tennis courts, a full-service spa and a restaurant. Close: Palm Meadows Golf Course, Lakelands Golf Club, Emerald Lakes Golf Club, Surfers Paradise Golf Club. 3 bedroom home suitable for 1-3 couples or a family, with well appointed kitchen, spacious lounge and balcony areas, a spa, sauna and swimming pool, set in bush. Dogs welcome. Close: Ramada Resort Kooralbyn Valley "Copperhead Golf Course" 1 km. 4-star hotel with restaurant, lounge/bar, full-service spa, an outdoor pool and children's pool. Other recreational amenities include a 24-hour fitness centre, outdoor tennis court and an 18-hole golf course. Ramada Resort Kooralbyn Valley "Copperhead Golf Course". Luxury self contained apartments with on-site golf course, outdoor swimming pool, BBQ facilities and work out centre. Close: Palm Lakelands Golf Club, Palm Meadows Golf Course, Surfers Paradise Golf Club, Palmer Colonial Golf Club. 4-star apartment complex with restaurant and outdoor pool. 15-minute walk to Burleigh Golf Club and 2 km to Mermaid Beach. Family-friendly fully self contained apartments with 2 outdoor pools and seasonal outdoor pool. Within a 15-minute walk to Burleigh Golf Club and 1.9 km from Burleigh Beach. 3.5-star apartments with outdoor pool and spa tub. Within a 15-minute walk to Burleigh Golf Club and 2.2 km to Burleigh Beach. The award-winning Escarpment Retreat & Day Spa is set amongst 4 acres of botanical gardens, with 6 private villas, a house, a day spa, spectacular mountain views, and free WiFi in communal areas. Tamborine Mountain Golf Club is 1.2 km away. Tucked away in gardens, this holiday home has 4 bedrooms, 3 bathrooms, a fireplace, a fully equipped kitchen, and a balcony with sea views. Tamborine Mountain Golf Club is 1.4 km away. Selected resorts or accommodation below are within 5 - 10 km of the golf establishments shown. Private, couples only fully self contained one bedroom cottage with a spa bath, Tallaringa Views boasts a balcony with hammocks, a barbecue and views of surrounding hills. Teven Golf Course 1.9 km, Ballina Golf Club 15 mins drive. 4-star apartment complex with outdoor pool, a children's pool, a spa tub and outdoor tennis courts. Choose from 1, 2 and 3 b/r fully self contained apartments. Small 8 unit complex in art deco style on the riverfront, with free long-distance calls, free WiFi and parking. Kitchenettes come with coffee/tea makers, refrigerators and microwaves. 3-star motel with outdoor pool, free parking, in-room free WiFi, and free continental breakfast. Stroll to Brunswick River and boat harbour. Close: Ocean Shores Country Club, Mullumbimby Golf Club 6.5km drive. Luxury resort with self contained apartments, restaurant, tennis courts, gym, outdoor swimming pool, full-service spa and wellness activities like yoga. Close: Directly opposite Byron Bay Golf Course. Spacious and comfortable self-contained cottages set in 16 hectares of remnant coastal rainforest with native birds and animals in abundance. Wheelchair friendly cabins. Dog friendly. 3.5-star caravan park/campground, self contained cabins with kitchenettes, outdoor pool, coffee shop/café, camp kitchen and more. Casino Holiday Park (aka Gateway Lifestyle Casino) pet-friendly resort features a 9-hole golf course, and outdoor swimming pool. All cabins are air-conditioned with a TV, and kitchette. Casino Golf Course 4 km drive, Kyogle Golf Course 35 km, Lismore Workers Golf Club 37 km. 3.5-star motel in Chinderah with just 12 rooms and free parking. Outdoor swimming pool and in-room free WiFi. All rooms feature flat-screen TVs and coffee/tea makers. Close: Coolangatta Tweed Heads Golf Club, Chinderah Golf Course and Driving Range, Club Banora 5.1 km drive. Gallery Motel Now with all new fit-out, the Gallery Motel (prev. Poinciana Motel) is located close to Tweed Regional Gallery and convenient to Murwillumbah town centre. Choose from King, Queen and double rooms, with free WiFi available. Murwillumbah Golf Club 3.2 km drive. Family-friendly hotel with 5 restaurants, 2 spa tubs, and an outdoor swimming pool, just 10 minutes stroll to Marine Parade, The Strand shopping centre and Coolangatta Beach. Coolangatta Tweed Heads Golf Club 6.7 km, Club Banora 6 km drive. Luxury self contained apartment complex with outdoor pool and fitness centre. 10-minute stroll to Coolangatta Beach and Marine Parade. Coolangatta Tweed Heads Golf Club 6.6 km, Club Banora 6 km drive. Spacious renovated cottage with wood fire (wood and kindling supplied). Good kitchen and large bathroom with quality fittings. Peaceful outlook over paddocks and distant hills.